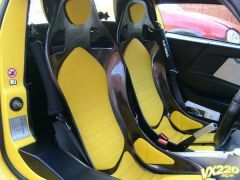 Im currently debating selling my pair of reverie mulsanne b single skin carbon fibre seats with yellow leather padding and the correct seat runners for vx220. Were only in the car for around 10000 miles so are pretty much as new. To buy the the exact same setup from reveries website today would cost over �4100 Not in any hurry to sell as would still like to fit them back in. just never got round to it and have been stored in the spare room for a few years now. Think theres a pic in my album of them if anyone wants to see them in the car. Open to offers via pm please. Forum rules state you have to put a price. Offers via PM is against forum rules I'm afraid. You need to state a price. Ok forgot about that. &pound;2000 ono. Reverie carbon seats! Very nice!.....must resist! From what I can see from reverie's website, the seats themselves are £589 each plus VAT. Cushion kits are about £160 per seat and subframe kits about £115. Where do you get £4100 from? Edited by Wolfstone, 04 August 2012 - 09:15 PM. Its also complete seat runners on both seats not adapters. Apoligies. Correct total is &pound;2445 had a ipad reverie web site malfunction there i think. Double checked it before something must have not updated properly. Sorry. Apoligies. Correct total is £2445 had a ipad reverie web site malfunction there i think. Double checked it before something must have not updated properly. Sorry. so I imagine a new realistic "for sale" price???? Apoligies. Correct total is &pound;2445 had a ipad reverie web site malfunction there i think. No still as new. Still a good saving for someone looking for these seats if no interest then no problem as i said no real hurry for a sale. Soooooo, You thought they were worth £4100 and wanted £2k And now we know they cost £2.4k and you still want £2k? No new how much they were when purchased just thought reverie had upped the price. And beleive me they are for sale at &pound;2000 "ONO" Have to put a price in as per rules dont have to get offered full price. If interested then we can talk if not leave be please. Maybe worth sticking them on eBay? might. thanks for the idea. just really seeing if there's any interest. would kill me selling them but if someone was interested in buying these seats new and was a saving for them then i wouldnt feel as bad. really like them they fit me much better than the standard leather seats only reason i took them out was i was doing a few motorway miles and the padding wasnt very good for long jouneys. Edited by mcewanslager, 04 August 2012 - 10:01 PM. would also like to point out that they give an extra inch or two head room as they sit much lower to the floor. so are ideal for taller vx drivers. Edited by mcewanslager, 04 August 2012 - 10:14 PM. How much do you want for these? think £1300 is a very good price delivered. £1145 saving not bad at all. still very good condition. plug and play. no messing around with subframes.